Why should we use LicensedNZ tradespeople ? is a question we often get asked. As you will be aware of , after a quick read of our site, to be listed on Licensed.nz , a trades business must prove they are current member of a trade Association that is relevant to their field of business. Members of trade Associations are interested in furthering their knowledge of their trade, keeping up to date with changes in their trade or in general laws that affect it, growing their business, providing great service on their jobs and networking with other trades to achieve better results for clients. 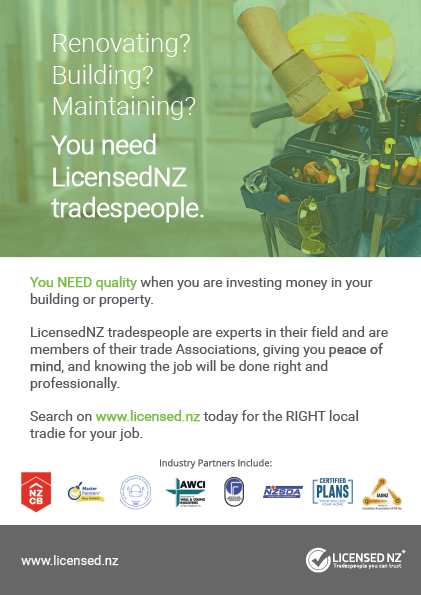 Whether you are hiring a builder, plasterer, suspended ceiling installer, painter, plumber, drainlayer or gasfitter, signwriter, roofer, electrician, tiler or insulation installer you can find them all here on Licensed.nz . If for some reason you don’t find the tradesperson you are searching for, fill in the form offered and we will use our extensive network of contacts to try and find somebody for you within 24 hours. We don’t rank tradespeople by reviews as they are consistently checked out by their Associations already and without sending a qualified person to review any work done we don’t think that online reviews can be totally honest apart from to say that a client was happy with the person who did the job. We are happy to pass on genuine endorsements or testimonials to the tradespeople you may choose to use. You can also view new posts on our LicensedNZ Facebook page .